Landscape architect Mark Lewis worked closely with local schools, Harko Brown (Kaitamatariki Trust), Tina Dyer (Park Central), and Te Auaunga project team (Tom Mansell, Healthy Waters Project Manager; WEC, and Fulton Hogan), to design and construct ngā taonga tākaro (traditional Māori artefacts) and natural play elements from recycled and found natural materials. The result is a playspace that offers children a unique and imaginative experience, while also reinforcing the wider values of Te Auaunga project to restore the wairua of the Reserves. There are many schools and early childhood centres in the area, and community surveys showed a strong desire for dedicated play areas in the Reserves. Mana Whenua suggested the project team consider integrating traditional Māori play items into the park, ideally under the guidance of educator and author Harko Brown, an expert in traditional Māori games. Mark says that after interactive workshops with local school children and Harko, it became apparent that a ngā aro tākaro playground was an ideal fit with the restoration of Te Auaunga Awa. In Māori society, traditional games and aro-tākaro (play items) are inextricably linked and highly valued. Ngā aro-tākaro reinforce social norms and connect people to their environments. They become a means for children to engage with nature and history simultaneously through challenge and learning. 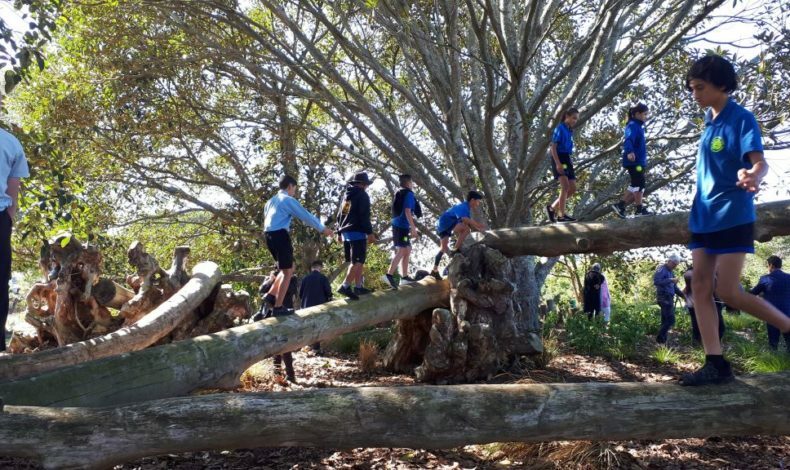 Community leaders, local school children, and Local Board members were at the opening; and while the children swarmed over the various aro tākaro , Harko Brown encouraged three intrepid local board members to complete a traditional exercise of climbing the kōpapa as a team. Kōpapa is a network of long logs, linked one to the other, to create elevated walkways. The 10-tonne swamp kauri used to connect the kōpapa was retrieved from another council project while the rocks used in the design were excavated from the site during the widening of the waterway.